You may remember the lovely people at Urban Earth, who caused me to walk across Manchester in the dark and then across Leeds. Last weekend they organised Urban Tweet Day, with people in loads of different cities tweeting about their days. 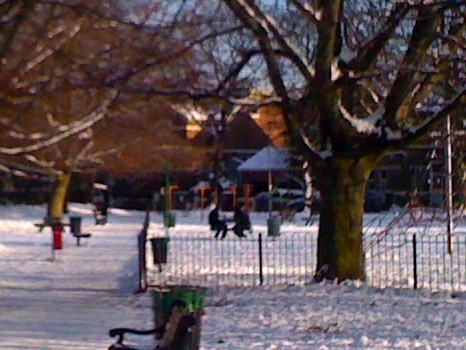 Mainly, it was all about the snow, surprisingly enough. There were some really pretty, poetic posts though – if you’d like to see it all, check out #utday on Twitter, or see a condensed version of the whole thing at the Urban Adventure blog. We still haven’t quite got the hang of tweeting, but I had a potter around Chorlton and tweeted some thoughts. I was feeling a bit disappointed that I’d not seen anything interesting, when the zedding gods smiled on me. 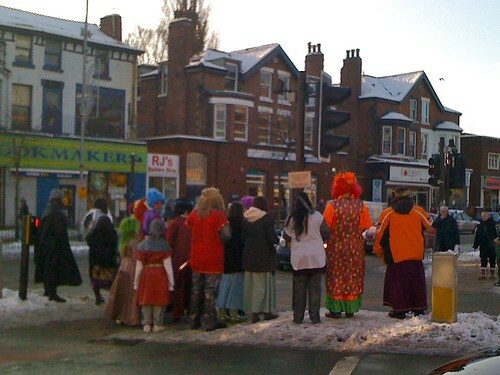 What appeared to be the entire cast of a pantomime wandered across the road, to much honking from passing cars. You really couldn’t make this stuff up. Eventually the cold became too much for me and I went for coffee indoors. Looking forward to the next thing, though: Urban Sound Week. Entry filed under: Other people zedding, Seen in the street.